2 What Is the Proper Way to Wear a Bow Tie & Wingtip Collar Shirt? In every man’s life, there is a good chance that he will need to wear a tuxedo to at least one event. In order to keep the process of putting on the tuxedo simple and easy, here are a few basic steps that will save time and make it possible to don the tuxedo in the least amount of time. Put on all foundational garments before attempting to put on any portion of the formal outerwear. This means the undershirt, underwear and socks. Don the tuxedo shirt next in the sequence. If the shirt is meant for wear with cufflinks or tuxedo studs, secure them in place as well. If the tuxedo shirt is a design that calls for a cravat or tie, leave off this element until later in the process. Next, put on the pants of the tuxedo. Make sure the legs fall to the proper length. If the design calls for a belt, slip the body of the belt through the loops on the pants and secure in place. If the pants design includes a simple Velcro seal around the waist, adjust to a comfortable fit and close into place. For tuxedo pants that are equipped with suspenders, adjust the length of the suspenders and slide them into place over each shoulder. Address any remaining accessories. Put on the shoes at this point. Vests and cummerbunds may be donned now as well. Make sure the surface of the shirt is smooth before putting on either accessory. 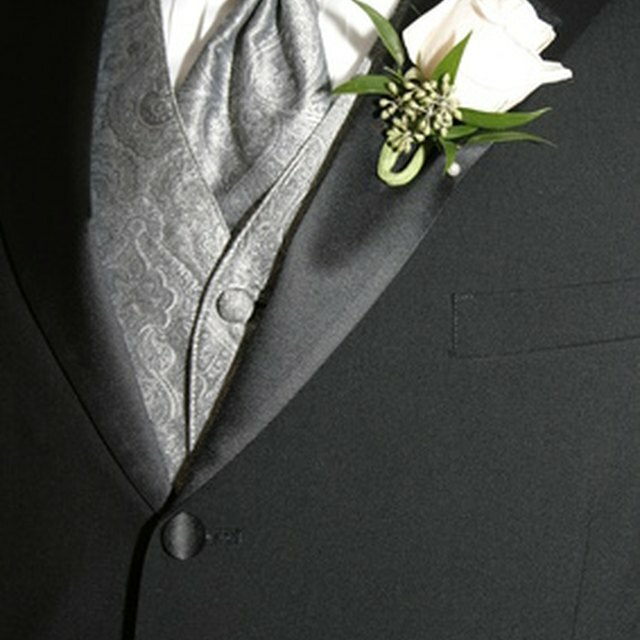 Add any neckwear that is appropriate for the design of the tuxedo shirt. Make sure to check in a mirror to make sure the bowtie is straight, or that the cravat is positioned properly under the Adam’s Apple and down the front of the shirt. Last, put on the tuxedo jacket. Adjust the lapels if necessary. If the cut of the jacket includes two buttons in the front, make sure that only the top button is used. This allows the flow of the jacket to blend easily into the pants and also makes keeps the lines of the tuxedo more uniform when walking. Lay out all clothing and accessories in the order they are to be put on. This saves time looking around for the next garment or accessory in the sequence. Don’t become too rigid in following this procedure. The world will not come to an end if you put on the tuxedo pants before putting on the tuxedo shirt. What Type of Shoes to Wear With a Leather Skirt? Could a Black Suit Be Worn Instead of a Tuxedo?